With the body of a bulldozer and the appetite of a hippo, pigs are not always the best choice for an idealistic hobby farmer. Most pig farmers buy “weaners,” piglets about two or three months old that are no longer reliant on their mother’s milk; they then raise the pigs to slaughter weight (typically about 250 pounds), which on factory-style farms is attained by the time they’re 6 months old. Keeping sows and raising piglets is generally left to professional breeders. My vision for raising pigs was a bit more quaint. I wanted to experience the whole life cycle, building a herd that included a mama and papa, aunts, uncles, and offspring – as nature intended. I had about 5 acres of woods for them to root around in. I envisioned them getting fat on acorns, and me getting, well, not fat exactly, but satisfying my daily bacon cravings with farm-fresh pork. My farm vet dissuaded me from purchasing a boar to start my herd by sharing horror stories about their razor sharp tusks and unpredictable nature. He said he’d personally rescued a guy from being trampled to death by an angry boar. So I decided to start with a sow. A pregnant sow. Ms. Piggie, as I named her, was a chocolate brown duroc-Yorkshire mix, with a mane of black hair running down her back. She was beautiful, all 350 pounds of her. This may sound strange, but I think pigs have the most human-like face of any animal – if you discount the snout and focus on the eyes, you’ll see what I mean. Ms. Piggie had these incredible eyelashes, just like Jim Henson’s muppet. The economics sounded promising: Pigs average about 10 babies per litter, so for the price of a few weaners I would end up with 10 pigs, plus a mama that I could breed again the next year, and the next, and the next. As with my goats, I would just rent a boar when the time came. That day never arrived, however, as my time as a pig farmer lasted just one stressful year. Here’s a few of the lessons I learned along the way. A couple months after I bought Ms. Piggie she started making a nest back in the woods. I had a luxurious space set up for her in the barn with nice soft bedding and a private corner where she could labor in peace. But she seemed to prefer a more rustic environment, piling a heap of pointy branches from a cedar tree I cut down. It looked like the world’s most uncomfortable nest to me, but I later realized that it was designed as a place for the piglets to run for cover if a predator came around. Although it turned out I was the only “predator” that Ms. Piggie was worried about. It turned out I was the only “predator” that Ms. Piggie was worried about. Early one June morning I found her next to her brush pile in the early stages of labor. I was in graduate school at the time, so I sped home to check on her between classes and each time found a few more piglets squirming around with their eyes closed. When I got home at the end of the day I was lucky enough to see number 10 be born. Piglets are tinier than you would imagine and the birth of each one happens surprisingly fast – with a single grunt the whole thing squirts right out. Number 10 was an auburn-striped runt that reminded me of a little chipmunk. I decided then and there that this one was too cute to become bacon. I named him Red. Ms. Piggie and I got along OK, but she wasn’t particularly amenable to human contact. So I wanted to try to handle the piglets as much as possible from birth in hopes they would be easier to approach later. That was definitely not going to happen. The piglets would squeal bloody murder every time I came near their nest, and if I got too close Ms. Piggie would let out a roar. After she charged me a couple times I decided to keep my distance. A couple months later I was walking through the herd when a few of the pigs started squabbling over food about 50 feet away. At that very moment I happened to be walking right by Ms. Piggie, who somehow inferred that I was the cause of her kids’ alarm. She turned and bit me on the leg, which felt how I imagine a one-ton vise would feel if someone clamped it down onto your calf. I sprang over the fence like an Olympic pole vaulter, and later, while sitting in the shade sullenly icing my bruised calf, I realized there are some valid reasons that pig farmers prefer to purchase weaned piglets minus their mothers. My pigs ate lots of acorns, rooted in the earth for grubs and worms, hoovered up mulberries, persimmons and other wild fruits that fell to the forest floor, and slurped up the whey left over from my goat cheese endeavors. I brought home garbage cans full of day old bread from a local bakery, and struck up a deal with a nearby natural grocer to haul off all their discarded produce. I also fed them organic pig feed in order to fatten them up quicker, but also to make sure they were getting the proper balance of nutrients and minerals. The local chefs I contacted said they would pay $3 per pound for pork, tops (when buying a whole or half pig, which was my plan), whether I fed them 100 percent organic or not. I was committed to feeding them organic grains, even though at $30 per 50-pound bag they were twice as expensive as conventional feed. By the time my pigs approached slaughter weight they were eating several hundred dollars of feed per month. After slaughter, each carcass weighed around 150 to 175 pounds, fetching me in the neighborhood of $500 each. You can do the math, but by the time you factor in ancillary costs – slaughter fees, vet fees (male pigs sold for meat must be castrated, and I was not prepared to attempt this myself), the original purchase of Ms. Piggie, fencing supplies, diesel to go pick up organic pig feed that is only available at one location in the entire state, etc. – not to mention the labor involved, you can see why my experiment in raising pigs, at least in the romanticized way I attempted it, left me in debt. If you’ve already read about my escapades catching escaped goats (here and here), you will really think I was an inept farmer once I tell you about all the times my pigs busted loose. The biggest lesson I learned about raising pigs is to take out a loan to build bomb-proof fencing before you even think about bringing one home. 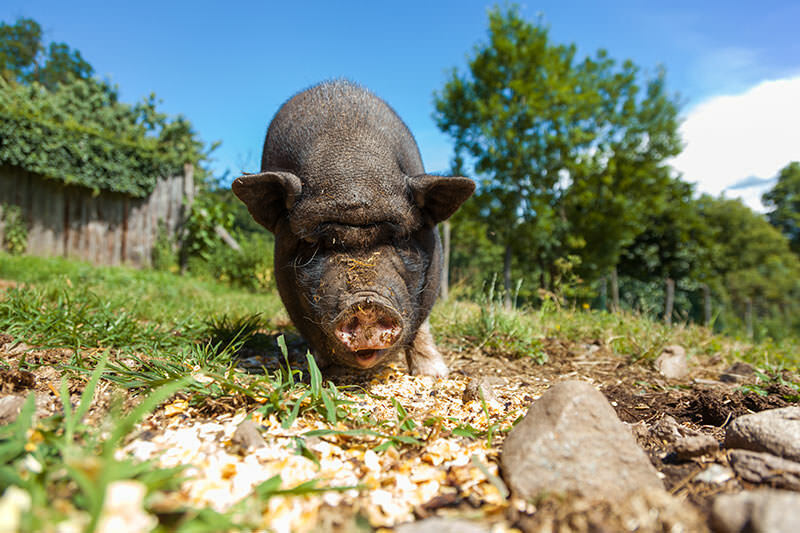 The head of a pig is built for digging into the earth and is strong enough to uproot small trees, boulders, and almost any fence they can get their snout under. There is special fencing designed to contain pigs, but I decided to pass on the thousands of dollars it would have cost to enclose my 5-acre paddock, which was already fenced, albeit flimsily. The biggest lesson I learned about raising pigs is to take out a loan to build bomb-proof fencing before you even think about bringing one home. Once Ms. Piggie escaped out the back of my property and gorged herself on the corn that my neighbor put out for deer. This was especially embarrassing because it was the same neighbor that had already helped me recover my escaped goats; and, given that he happened to be the local sheriff, I’m lucky he didn’t fine me. Piglets grow to be strong as an ox by the time they’re a few months old, and one time a few of them busted through my weathered barn door and wandered out into the road, to which I was alerted by honking motorists. A policeman happened to drive by as I was coercing them back onto the property, but he was nice enough to get out and help, rather than write me a ticket. I guess I was far enough out of the city where cops don’t look too unkindly on such matters. Other debacles included pigs in my neighbor’s flower garden, and pigs getting into my garage where I kept their food, along with my household trash cans and lots of other stuff – it looked like a hurricane had passed through when their little party was over. They also turn over anything with water in it in order to make a mud bath, making it difficult to provide them with a fresh, clean supply for drinking. Yes, there are special watering devices made for pigs, but like other heavy duty livestock equipment, they’re not cheap. There were more mornings than I care to remember when the sound of oinking outside my bedroom window meant the pigs had once again torn through my latest efforts to reinforce the fence and were tearing up the yard. Years later I still have nightmares about it. By the end of my first year raising pigs, I knew it wasn’t for me. I wanted to do it in a way that I felt was ethical, and healthy for the land and the animals; but I quickly realized that it wasn’t economically sustainable, especially for a guy trying to finish graduate school. I could see making a modest living at it had I taken out a second mortgage on my home to scale up the business, but I had other interests that I wanted to pursue. And I’m afraid to say that I never did end up with any bacon. I had pork roasts, ribs, and sausage coming out my ears, but the nearest USDA-licensed facility I could find that actually made bacon was more than a two-hour drive from my farm. The price they charged to cure such small quantities of pork was almost as much as buying bacon at the store. Plus, I learned that my pigs hardly had enough of a belly to make bacon, despite how much I fed them – bacon is made exclusively from pork belly, which only develops on such young pigs if you stuff them with corn-based feed. As much as raising my own food brought me great satisfaction, and at times full-throttled joy, in the case of my pigs it was also one of the most stressful things I’ve ever experienced. Brian Barth is a contributing editor at Modern Farmer. He used to raise goats, chickens, pigs, and other critters on his farm in Georgia. But now he just writes about farming. I have 20 just as PETS! They’re incredible…better than any dog I have ever had and SMART! Fencing was a fairly easily completed with electric…3 lines they don’t like it and stay away. any advise for going into commercial pig farming? I’m also interested in piggery, and would really love to venture into this. Please advice on how to start. Can one maybe consult with the Department of Agriculture for purposes of getting a mentor. The thing is that I want to concentrate fully on this business. Is it advisable to invest with my pension on this . Willing to start pig Farming can you please assist me which are the things to start with.What kind of the place for pigs(Housing plan) do I need.